With mid-November temperatures in the mid-60s and the Single Speed Cyclocross World Championship race looming, volunteers joined the Belmont Plateau Trails Alliance (BPTA) for Love Your Park day. 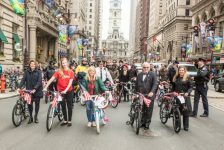 Love Your Park Day brought out over 40 volunteers to work on the trails that have come to define real Philly mountain biking to the seasoned dirt searchers. 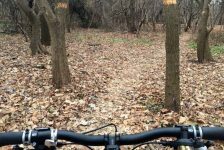 The well-skilled volunteer crew cleared some trouble spots, removed trash, and rerouted and redesigned entire sections of trail, all while focusing on the ride. Of the work done by the volunteers, Mark Elk Elsasser of the BPTA said I have been dreaming of rerouting this trail for three years and you guys went ahead and redid it in three hours. Throughout the work day, the workers focused on good trail design and followed the guidance of some of the Belmont trail-building legends. The trails were built with sustainability and drainage in mind, but the quality of the ride was always next on their mind. The constant refrain was How will this flow? Volunteers were well aware that the eyes of the world were going to be on their handy work very shortly. In three weeks, racers from all over the world will toe the line at the Plateau and have their first true taste of Philadelphia trails. The Single Speed Cyclocross World Championship final race will be held at the Belmont Plateau on Sunday, December 8. The Belmont Plateau course really has something for all of the racers and all of their fans. One of the volunteers remarked that the course is 1/3 ‘cross, 1/3 gravel, 1/3 trails, and 1/3 ridiculous.